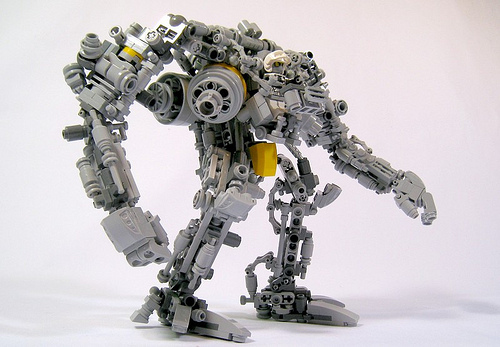 Builder Tsan-Nien added me as a contact yesterday, and I couldn’t get over his latest creation. This is a great mecha, I really enjoy the mechanical exo-skeleton feel. It has some style similarities to to a Matrix APU, or some smaller exo-suits we’ve seen before, but it also has a lot of cool, unique features. I especially like the fan/vent/cylinder things on the sides, and the gorilla-like proportions. It’s definately greebletastic but it realy looks like it’s missing coverring plates. It just feels like to much exposed machinery. I do love the posture. This is exactly how I picture hardsuit mecha as being, long arms for extra stability or utility, cockpit high and central over what the frame is working on but enclosed to protect the opperator. I love it. I ride a “naked” crotch rocket motorcycle. I’ve always preferred the exposed innards over the slick Japanese bikes with all the plastic panels. This thing looks like it crawled out of a junk yard. It has soul. Hey, I love Taiwan, my wife was born there! I’d be happy to blog more MOCs from over there, if folks would just post them in places where I look at LEGO. I’m loving the mini fig legs for fingers, they are perfect.